Writing must be my salvation this winter. I can sit for hours over a piece of writing. Write, edit, write, think, write, edit. I’m sure it shows…such high quality verbiage. I wake up in the middle of the night and want to go out to my computer to write. Last night when I woke, I knew that was a bad idea so I took a half a trazadone (a medication used to treat insomnia, depression, and schizophrenia) instead and went back to sleep. I’m pretty sure I was suffering from insomnia and not schizophrenia. I think part of my waking problem has been Regis’s absence with his cold and his finals. He’s been distant and preoccupied. I understand completely but I miss him and feel lonely and miserable without him. I hope after his finals today and with his improving health, we can connect again. We’re trying to make a decision about refinancing our house. We’re both awful at financial things so we feel completely out of our league. This requires planning ahead and knowledge about financial affairs of which we have none, not being readers of the Wall Street Journal. We have managed, for the most part, to be debt-free, a state of affairs for which we are humbly grateful to Howard, but we’re grasshoppers, not ants. Our plan to have kids for dinner prior to Christmas has been going well. Peter came last night and we had a wonderful time. He would probably say, understating, that it was fine, but not wonderful. One of the joys of getting older is that you need far less to consider things wonderful. Not falling down on your way into work is wonderful. A good meal is wonderful. Having warm feet is wonderful. It doesn’t take much. 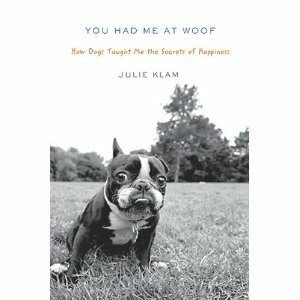 I bought Jan a book called You Had Me at Woof: How Dogs Taught Me the Secrets of Happiness. She raises Boston Terriers and loves dogs. She was a good friend to Kramer in the last couple years, always bringing him a treat. He loved her back, always very excited to see her. One of the last times she saw him, she cried when he had trouble with his legs on the linoleum. Bless her heart. I’ve been talking to my Cousin Deb about our love of all things shiny and sparkly. She wondered if it is about getting attention. Rhinestones and flash. I’m not sure about that since I’m not sure the attention is always all that good…what I get from my rhinestones. More like a strange curiosity. What is this woman doing sporting all that cheap jewelry? I wonder if it isn’t more about the dark. Sparkly things light up the dark. We’re under another winter storm warning. This time it’s for 5-8 inches of snow with blowing snow and poor visibility. I don’t see any mention of sub-zero temperatures which will be a blessing. Well, one of those good news/bad news kind of things. No school today. I had Regis go out and measure the snow on the bird feeder which I cleaned off yesterday when I came home. Looks like about 8 inches as of an hour ago. Wanting all things shiny and glittery comes with age. I was never too crazy about sparkles when I was young; now I love anything that shines. I have a rhinestone bracelet that is about 60 years old. Maybe I will give that to you, Teresa.